The ION Clipster Ultra-Portable Bluetooth Speaker offers an entertainment solution on the go. Listen to your favorite music without any hassle while biking whether through the streets, exploring mountains, riding trails or just walking to the mall. Play music wirelessly through Bluetooth connection with the music player nested safely in your purse or backpack. It works well with iPod, iPhone, iPad, smart phones or any music device with Bluetooth capabilities. The volume controls are large enough to allow for easy adjustment of the volume and it is powered by battery that are rechargeable and give hours of use on a single charge. Ability to play music wirelessly from any music player with Bluetooth capabilities. 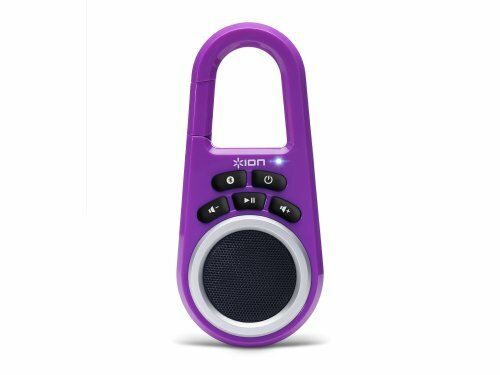 Compatible with Apple and Android Bluetooth enabled phones and music players or any Bluetooth music player. Comes in multiple color choices for added beauty. The ION Clipster Ultra-Portable Bluetooth Speaker offers a lightweight and compact solution for music lovers. It is encased in a sturdy body made from plastic. The included battery lasts very well and it comes with a USB cable that can be used for charging the unit. It comes with big controls for volume and pause/play, which allows for easy manipulation and the sound quality, is decent considering the price value. It connects perfectly via Bluetooth and seamlessly outputs a crisp and clear audio quality. The connection is strong and so long as the distance between the device and the speaker is not too far, the connection will not disconnect. It comes with clips that you can use to attach the speaker to wherever you want to and they hold the speakers pretty tight to prevent them from falling off. If you are a die-hard music lover and would like to bike everywhere listening to your favourite songs, then the clipster is the speaker to get without burning your pocket and it delivers good sound quality.